Fig. 1 Central to genetic issues are the patient and the family. Various interactions involving a range of health professionals and support groups provide the optimal approach in dealing with molecular genetics (genomics) issues. What particular combination is needed will depend on the underlying problem and the ability of the patient and the family to deal with associated issues. units have formed in many medical centers, and the work undertaken extends from traditional fetal medicine and pediatrics problems to adult genetics. The distinction is made because training in genetics has often come through pediatrics, but this is now changing because molecular genetics has relevance to any age group. For example, the geriatrician of the future will need to understand molecular genetics as knowledge is gained about the molecular basis for aging, including common disorders at this time of life such as dementia, heart disease, and osteoporosis, to name a few. Genetics clinics, comprising the specialist physician and the genetic counselor, ensure that DNA testing is appropriate. The clinics provide relevant counseling and support, particularly in circumstances of predictive DNA testing where an adverse result has implications for the patient and the family members. Because of the nature of molecular genetics, these clinics are often broadly based and deal with issues ranging from dysmorphology to pediatric genetic problems, to reproductive genetics, and to an increasing range of adult-based genetic issues and community ''public health'' screening genetics. 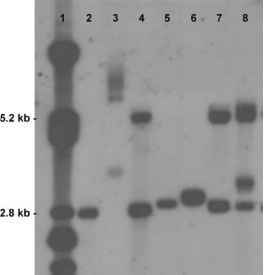 This arrangement has allowed molecular genetics to develop rapidly. However, it is now time to rethink and consider the future model for clinical genetics, particularly in the light of the vast amount of data that will emerge in the next few years. The clinical practice of the future will need to contend with an expanding database of knowledge gained from genomics that will overlap many clinical disciplines. The physician of first contact, the family physician, is asked by patients about genetic tests that have been featured in the media. Patients and families are becoming increasingly aware and knowledgeable about genetic disorders and DNA testing because of the media and access to the Internet. The complexities and sheer volume of knowledge about the genome require novel and computer-based learning activities. 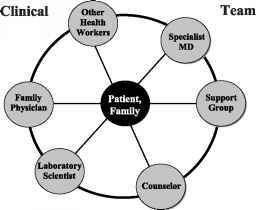 Greater specialization is inevitable, and general genetics clinics will increasingly need to move into multidisciplinary clinics involving a number of health professionals including family support groups. This molecular medicine team will ensure that the level of knowledge is contemporary, and that the patients and their families can have access to advice from a range of experts, as well as access to support from other parents or families with experience in genetics problems (Fig. 1). Without this division of work and close interactions between various disciplines, resources and expertise will be severely limited when our understanding of multifactorial genetic disorders (common conditions such as dementia, heart disease, stroke, and sporadic cancers) adds a DNA dimension to their prevention and treatment.